Just wanted to let you know we had a great experience with both your drivers. 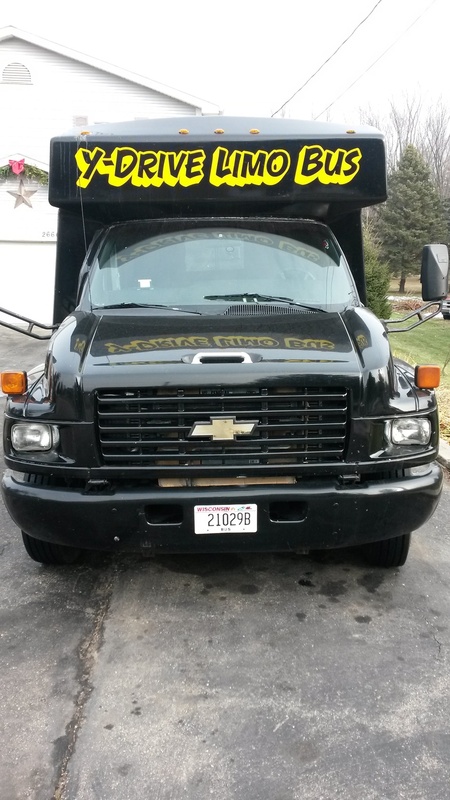 We will definitely plan to use you the next time we have a big event in the area. Just wanted to send a HUGE thank you and recommendation to your driver that drove for our event, over the weekend, on May 5th. He picked a large group of kids up for Prom at Old World Wisconsin and was wonderful with the kids! They all enjoyed the bus ride - and many said it was their favorite part of Prom. Just wanted to say Thank You - and we will highly recommend you to anyone looking for services. I just wanted to say a quick thank you (so much) for everything you did to make Deanna + Paul's wedding FANTASTIC. I think it’s safe to say everyone had a blast on Saturday EVEN THOUGH nature was totally stacked against us. I know it takes a village to make it happen as seamlessly as we did (especially under those circumstances), so thank you for being an amazing village to work with over the past couple of weeks and especially as we got down to the final days! I hope to work with all of you again in the very near future! Just wanted to let you know, everything was just awesome! We had a great time. Y Drive Limousine was clean, on-time, friendly and most of all, we felt safe. The driver took care of everything from setting up the games to cooking our food. He even cleaned up and had the bus packed and ready to go when we got out of the game. We will use this company again and again! Thank again! I just wanted to write to you and say how awesome of a driver BD was! He was the best bus driver I have ever experienced and everyone seemed to agree. Thanks for an awesome service and I look forward to using your service again along with BD as the driver! Thank you so much for your hard work with our transportation the day of our wedding. A special thanks to our driver Jay. He was extremely kind and flexible with our wedding party. I will recommend your services to anyone. Hello Scott, I just wanted to send you a note on behalf of everyone on the bus this past Saturday. We all wanted to say thanks again to Bob, he was an amazing bus driver, and went above/beyond our expectations. I am very satisfied with choosing your company. As previously discussed, we are having another benefit in early September. I am also planning another pub crawl the day before the benefit to spread more awareness and advertising for the benefit at South Shore in September. I would also like to come to talk with you in early June to see what other services we could use at the benefit. Once again a big thank you for wonderful service!!!! Sincerely - AnnaBelle Lynn and the Charlie's Angel Pub Crawl Crew!! I emailed you from home last night, but wanted to make sure to let you know how totally satisfied I was with your services. Loved the bus and driver. I know any one of the 24 people in attendance would be game to use your services again!! We had a great time on Saturday, the driver was awesome! Hopefully everything went ok, we were a little loopy when we got dropped off lol. Thanks again and we will certainly use you guys and recommend you to others. Leasing Representative BEI Properties a division of Batavia Enterprises, Inc.
Just wanted to reach out to you and let you know that we had a fantastic experience with our bus driver, Brian, for the Buffett concert. We have been going to Buffett for a long time, and have had a lot of drivers, and Brian was BY FAR the best driver we have ever had. He was so nice and helpful as well as extremely accommodating to our crazy group! We are already looking forward to next year, and will definitely be using you guys again...hopefully Brian!!! Thanks again Scott! I wanted to take another opportunity to thank you for all your hard work in coordinating the group transportation for the 2011 Continental Finance & Controlling conference. Your willingness to go above and beyond in all elements of weather AND with a smile was appreciated. I have heard nothing but praise regarding the conference and the organization. Thanks for helping me make the conference a success. If I am ever in the Wisconsin area again and need group transportation - I know who to call! I would highly recommend Scott from Y Drive Limousine to any potential cliental. His professionalism and ability to communicate brought great relief to me when working with him for my companies outing. His refreshing humor and initiative to accommodate our every need was appreciated on every level. I have dealt with Scott on numerous occasions during and before our company outing, and will continue to use his services every year. Scott is a dynamic and energetic individual who enjoys his profession and it positively reflects on each client. As the assistant club manager of Big Foot Country, I stand by and support Scott Thomas and his business. GREAT SERVICE!!! We had such a fun time and our driver "Jay"? was great! We will definitely use you guys again next time we plan a trip to Alpine! It took me a couple of weeks to recover, but just want to check and make sure everything was ok after the event. Our group had a blast on the bus and we plan to keep Y Drive in mind for future booze cruises. One other thing, I am pretty sure I tipped the driver, but I was a little overserved. I just want to check and make sure I did and that I didn't screw him over. If there is any way you could let me know I would appreciate it.